The advances in technology and the changes in living standards have aroused a steadily growing interest in technical textiles. 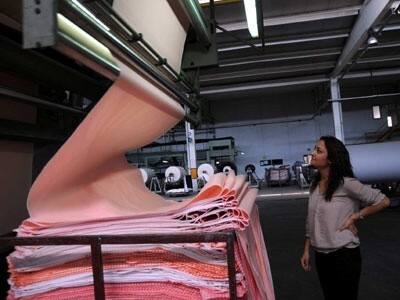 Accounting for a 200 billion-dollar world market, technical textiles have also exhibited growth in Turkey. Turkey has recently become more ambitious with regard to these products and last year, technical textile exports reached a level of 1.3 billion dollars. This year’s target is 1.5 billion dollars. Various competitions have been organized to support the work being carried out in this field. One of these competitions was the International Textiles and Apparel R&D Project Market Competition organized under the strategic partnership of the Uludag Textile Exporters Association (UTIB) and the Bursa Chamber of Trade and Industry (BTSO). A total of 235 projects were showcased in this year’s competition. Meanwhile, the Union of Istanbul Textile and Apparel Exporters Associations (ITKIB), organized a “Technical Textiles Project Competition” in cooperation with the Turkish Exporters Assembly and the Ministry of the Economy. The competitions contributed to accelerating the recent development of the technical textiles sector. Whereas only one or two companies were operating in this field in the early 2000’s, now there are over 200 enterprises in the market. These companies are not only the first choice of domestic brands but also of international brands. Making a significant contribution to the country’s volume of exports, these companies are quietly moving ahead in the textiles sector. Companies such as Söktas, Yesim Tekstil and Bossa are now producing many technical products, ranging from antibacterial to deodorizing fabrics. Among the interesting presentations at “Project Market” this year were sound-insulated curtains, textiles that extend the storage life of fresh fish, bee-repellent textiles, the use of fire-repellent textiles in the automotive sector, food pads that extend the shelf-life of food products, medical textiles that prevent the propagation of fungi and bacteria, the manufacture of three-dimensional knit fabrics that provide orthopedic support, and insect-repellent textiles for agricultural workers. With the rise in foreign exchange rates, the Arab Spring and rising prices in China, buyers groups are once again turning their eyes on Turkey. While in the past, Turkish manufacturers had been losing customers to the competition in other countries because they were unable to match prices, they are now regaining these clients. From M&S to Zara, Tesco to Gerry Weber, the world-famous groups of buyers are expected to purchase products worth about 5bn dollars from Turkey in 2012. The president of the Turkish Apparel Manufacturers Association (TGSD), Cem Negrin said that purchases from Turkey were expected to increase in the second half of 2012. Negrin disclosed that Zara had bought 1bn dollars worth of goods and Li Fung had made purchases of 600mn dollars, adding that the 12 major brands with offices in Turkey were expected to reach a total buying volume of 5bn dollars. Negrin said that there is no other country located around the EU that can be a rival to Turkey. Asserting that purchases would increase toward the middle of 2012, Negrin further said that this New Year’s biggest surprise had come from Japan. Japan’s largest food retailing chain Aeon had made some investigations in the Aegean region, after which it started to purchase textiles from Turkey. With 391 chain stores all over Japan, the company was exploring the Aegean region for a range of products, from food to textiles and leather, and placed its first order with Yesim Tekstil. With an annual turnover of 59bn dollars, the company is significantly ahead of many small countries. Yesim Tekstil CEO Senol Sankaya told that in their purchases from Turkey, the Japanese were particularly interested in organic products and focused largely on casualwear. Textile sector is a traditional industry of Turkey and one of touchstones of success story in export. Textile and ready wear sector in Turkey today has maximum surplus as a whole. In addition, it has to make a contribution seriously reducing unemployment and raising society’s wealth with its employment. Turkish Textile Sector has a very special place in the world with its quality, designs that determine fashion and trends, and its high technology. Textile sector has first rank in Turkey in terms of its share in GNP and in use of domestic inputs, and to form the basis of our existence in global markets. In textile sector, Turkey is the sixth at spinner capacity, and the fourth at rotor capacity. Turkey is the largest textile producer of the continent of Europe. Turkey is the seventh largest cotton producer in the world. In home textile, engine park for embroidery and guipure is the largest in the world. The largest factory for bedlinens in Europe is in Turkey. Turkey is the third in towel producing in the world. Turkey’s share is almost 3% in world textile export, 4,5% in home textiles and place textiles and 1,5% in technical textiles (2011). within hours of flight distance from any European city. in line with global trends and latest innovations in the world of fashion.